Arutz Sheva accompanied the Taoz Battalion of the Military Police, which provides security at 32 crossings in Judea and Samaria. Arutz Sheva’s Kobi Finkler & Yoni Kempinski accompanied the Taoz Battalion of the Military Police, the soldiers of which provide security at 32 crossings in Judea and Samaria (Yehuda and Shomron). The tour included meetings with the battalion commander and some of the soldiers in the battalion. 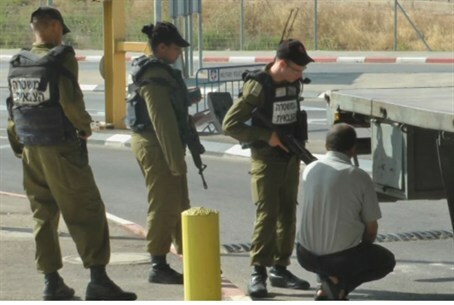 Arutz Sheva also got to observe as the soldiers inspected a Palestinian Authority Arab. He explained, “The art of inspection is made up of two situations. In any situation in which we have to inspect, we prefer to carry out an ‘AA inspection’, or inspecting one by one. I prefer to inspect person by person, vehicle by vehicle, to carry out disassembly and assembly. That’s what guarantees that I will fulfill my responsibility to ensure that this vehicle is clean of any objects, people or means of terrorism. The tour included a visit to one crossing in which there is no direct between any PA Arab trying to cross and the inspecting soldier. The inspection takes place in a sealed building which is explosion-proof.